It was just a matter of time until my game development hobby started creeping into my serious work. I have made an application prototype, that draws a 3D graph, using what is essentially a game engine. The application can be run on Android, iOS, Blackberry and desktop (Windows, Mac OSX, GNU/Linux). 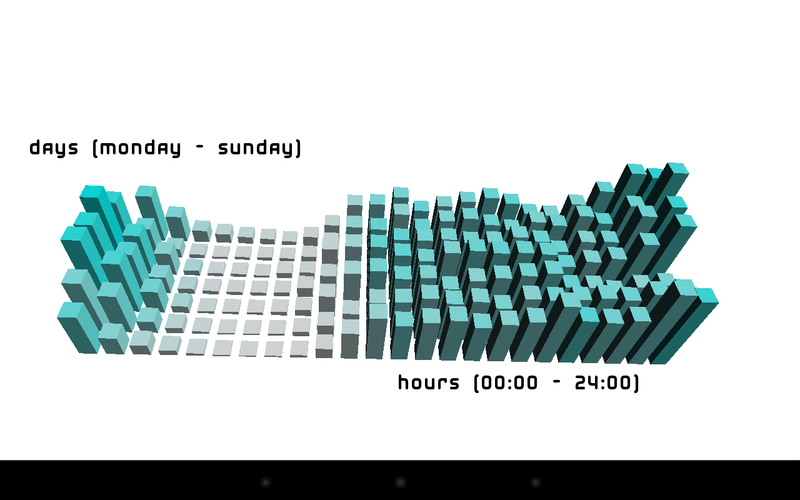 The graph is displaying activity on our IRC channel for every hour of every day of the week. It’s a rough prototype. The camera is fixed, labels don’t really show what the graph is about, and it’s ugly. The app is written in C++ and uses OpenGL ES for rendering. It could handle beautiful animations of realtime data changes without breaking a sweat. And the same code could be used for most smart phones and tablets1! The game engine I’ve used is called Gameplay and it’s the easiest way of creating crossplatform mobile applications I’ve managed to found. (I have also tried with OGRE and SDL). Now lets see if I can make this prototype into something actually useful. You can check out the source code on Github, but there is not much there yet. 1 Not on tablets and phones running Windows though. It seems to be the only mobile platform not using OpenGL ES. Follow me on Twitter or send an email.